This book is Women's Fiction, which I love to read. I love reading about the trials and tribulations of life - to other people! LOL! This is the first Sarah Pekkanen book I have read, and I thoroughly loved it! I loved the characters as they were real and had depth to them, and I could feel a connection with all of them, surprisingly. I didn't think I was going to be able to connect with Savannah because of her flirty and sometimes slutty ways, but I did after a while. Once you got behind her hard shelled surface, there really was a loving person in there. For that matter, it was hard not to connect to any of the characters they were so very realistic. It was very easy to follow the story and each character, too, even though there were four couples. Pekkanen pulled this off to a "T"! Each chapter would talk about one of the characters and I was enjoying it so much wanting more I was so into it, but sometimes I would turn the page and the author switched to different character. That was a little frustrating, but a sign of excellent writing, keeping us glued to the story wanting more and flipping the pages wildly! 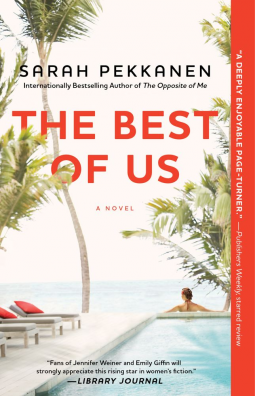 I will be seeking out more of Sarah Pekkanen's books she writes because I was just could not stop reading this one! She really goes into detail with each character and/or the characters' relationships with their spouses and their friends. That is four couples, or eight characters. I was carried away in bliss in this novel. I carried my Kindle through the house, everywhere I went trying to sneak in a few more sentences here and there, which I think you'll be doing, too. This is a book that if you had the time to sit and do nothing else but read, it will keep you captivated for hours until the end. It is Dwight's 35th birthday, and his wife, Pauline, really wants to celebrate it. Little do her guests know yet she puts together this 5-star luxury stay at their resort they own in Jamaica complete with private transportation on their private jet, culinary chefs who cater to every guests meal and individual needs and desires when it comes to any food for that matter, any help that could be needed, snorkeling, body boards, everything you can imagine she has done that would fulfill and complete every guests whim. Made me tired with all that she arranges. She is one amazing host! Even though she sounds saintly, she has her own set of problems. Her husband Dwight wants to have children, and Pauline has not been able to give him any . . . yet, at least, and this weighs very heavily on her shoulders, not to mention she harbors a deep, dark secret she can't let loose. The other thing that bothers her are these are friends of Dwight's from college. Can she trust these women Dwight went to college with around her husband? Yes, he was considered a huge dork back in college, but money and age do make a difference, so could that be a concern from any of these guests of his whom she barely knows? How would you like to get an invitation in the mail from an old college friend who happened to make it rich, so rich that you and your spouse are invited to an all-expense paid round trip, on a private jet, to your friend's personal villa in Jamaica? Personally, I would die! All four couples end up going on this trip, except one husband. Savannah's husband. It's up to her to decide what she is going to say . . . ? Tina, married to Ryan with four kids, dressed in her nightgown gets a knock at her door, and to her shock opens the door to see a messenger dressed in a tuxedo handing her an envelope when all she thought was she was just getting a delivery from drugstore.com. She gets on the phone with Allie and they are both excited. This invitation could not have come at a better time as Tina feels so run down with caring for four children at home, especially as she is reading the invitation, her youngest gets sick all over her. She is so tired. Allie, married to Ryan and very close friends with Tina, lived next door to Dwight while in college. They never dated, but are extremely close friends for life and still confide in each other. Ryan worries he'll feel like the odd man out. Just prior to leaving for this vacation, Allie finds out her future health may be at risk from a deadly disease. She feels she must keep this a secret and tell no one, not even Ryan, but can she live with this heavy burden that could made her husband a widow and her children motherless? Hurricane Becky has been looming in the background the week they arrive. Do they ride the storm out? Do they make it okay? It's only a category 2 storm, but . . .
Come join this wholesome cast of characters you're going to fall in love with while spending time on a first class vacation in Jamaica for a while and let loose as they do. You're going to fall in love with these characters! At least I did! This was the perfect vacation to read in this record setting below zero temperatures and record setting 'stuck in the house' snowfall this year, at least for me where I live! I couldn't have chosen a better time of year to read this one! "But then again, didn't all marriages carry thousands of hurts? Didn't husbands and wives injure each other all the time, leaving wounds big and small, with a snapped word or forgotten anniversaries or emotional buttons deliberately pushed? But thousands of kindnesses existed in marriages, too. The important thing was that the kindnesses triumphed over the hurts." I received this book for FREE from the Publisher, Atria through NetGalley in exchange to read and write a review about it. It is NOT required for this review to be either positive or negative, but of my own honest opinion. "Free" means I was provided with ZERO MONIES to read this book nor to write this review, but to enjoy the pure pleasure of reading it. I am disclosing this information in accordance with the Federal Trade Commission's 16 CFR, Part 255, http://www.access.gpo.gov/nara/cfr/waisidx_03/16cfr255_03.html Guides Concerning the Use of Endorsements and Testimonials in Advertising.